Surnadal in the north part of Møre og Romsdal is a good point of reference. The access from Trondheim via Orkanger is quite convenient. Drive south from Surnadal, then turn left into Øvstbødalen. This road turns into a toll road (NOK 30 in 2014). Continue until a road fork with signs for Trollhøtta (right). Drive a short distance and locate a small parking area just before the road gets considerably rougher. This location is N62.92187, E008.83988, elevation about 255 meter. Continue along the road to Mellingsetra, then onwards on a trail that is marked with red paint. About 3 kilometer from Mellingsetra, you will see the route climbing about 400 (vertical) meter to the col south of Seterknubben (993m). It is a bit unclear if the red marked trail somehow also serves this col. However, it seems quite good to just start an ascending traverse avoiding brush, to gain this col.
From this (910m) col proceed south towards point 1051, then up the very smooth ridge to gain the 1291 meter first summit. 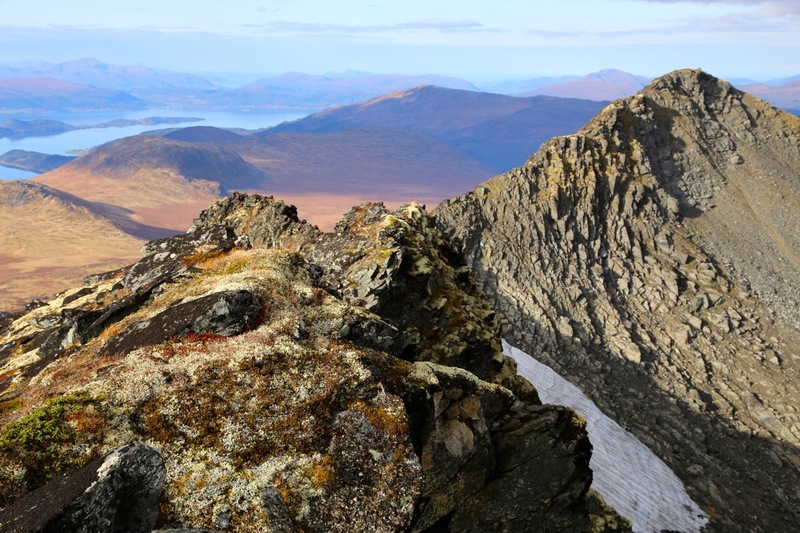 There is a visitor register as well as a nice cairn on this summit. 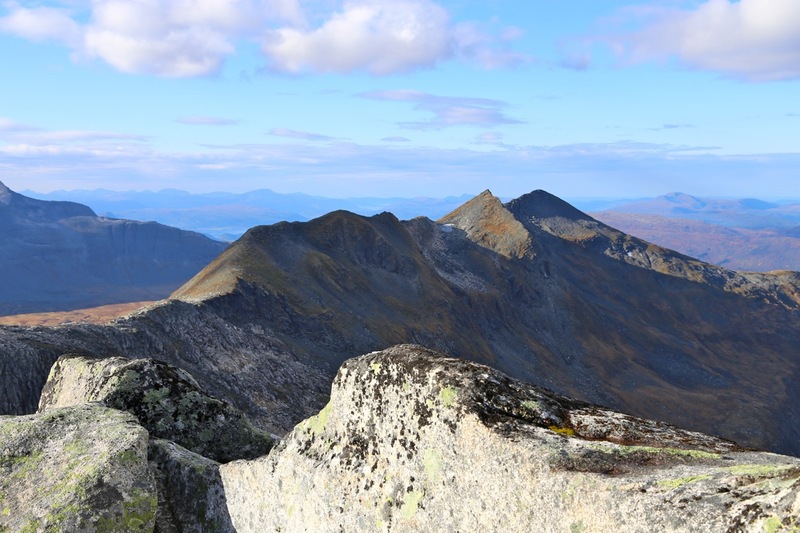 From this summit, the route called the "Trollhøtta traverse" runs across two more summits to the summit of the highest point at the far end (south-east end) of the ridge. This ridge is fairly narrow, but not difficult across the first (descending) section. As you climb towards point 1299m, the most difficult section is encountered. First, go right to avoid a steep section of rock, then immediately scramble back to the top of the ridge using a narrow crack. Continue along the top ridge. There are a few exposed parts where the difficulty remains at (YDS) class 3. Finally, on easier terrain, finish the climb to this 1299 meter summit. 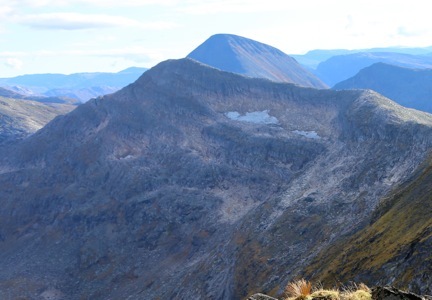 The rest of the traverse, including the crossing of summit 1272m, stays at class 2. 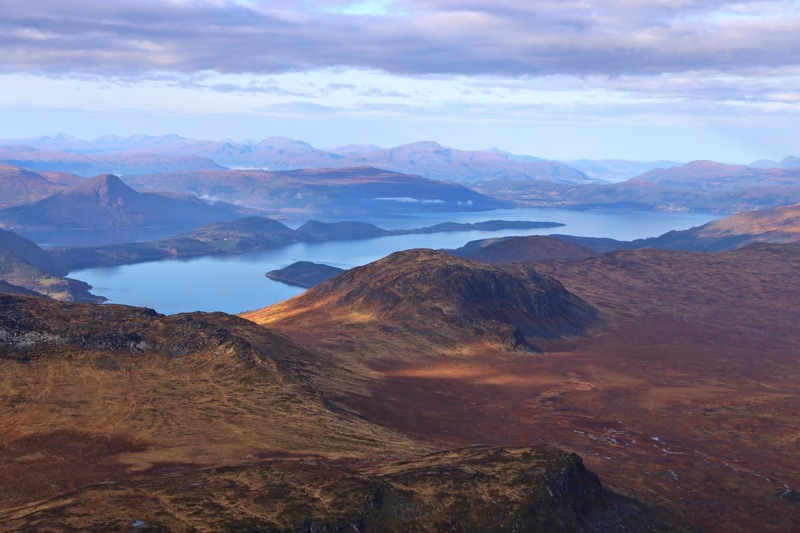 The return route from this summit provides a class 2 route, that is, one may use this route also for climbing if one primarily wants to find the easiest route. 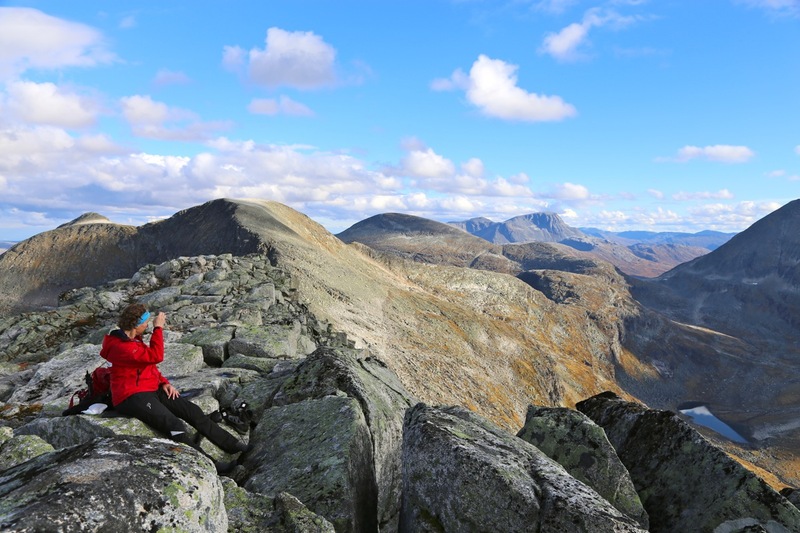 It should be stressed that the ridge traverse is highly recommended and that it has qualities as a route that are far superior to the "valley route". 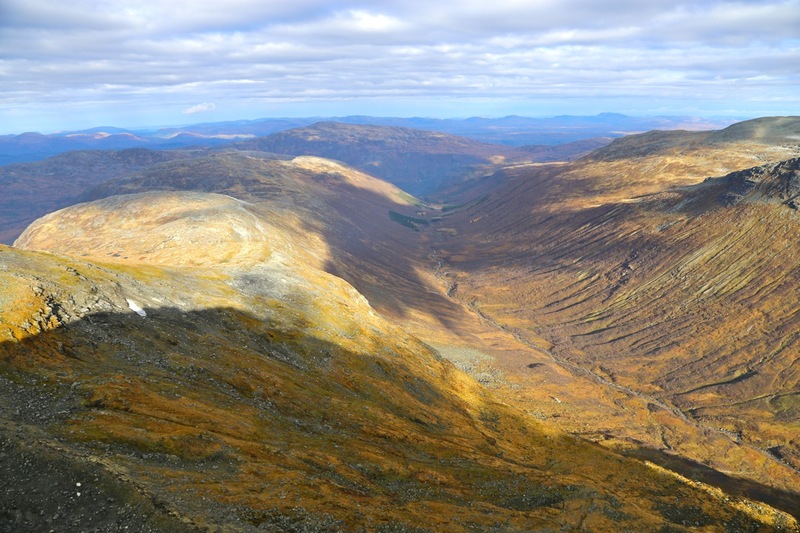 First, descend to the col between Trollhøtta and Pekhøtta. Next, descend (left) north. There is a cliff-band at the lower part of this first section, the best way down is to stay all the way to your right (east). Lower down, it is important to know that the entire area between the two lakes (lake 887 and lake 810) are filled with difficult rocks. Therefore, one should stay north of this area when continuing the route towards the valley further downslope. Stay north of the boulders, then descend to the lower end of the very small lake/pond around elevation 800 meter. A small trail will lead down on the left side of the small creek. Further down, pick a route that avoids most of the brush and eventually recover the trail used on ascent (marked with red paint). Finally, return to the trailhead following this trail. 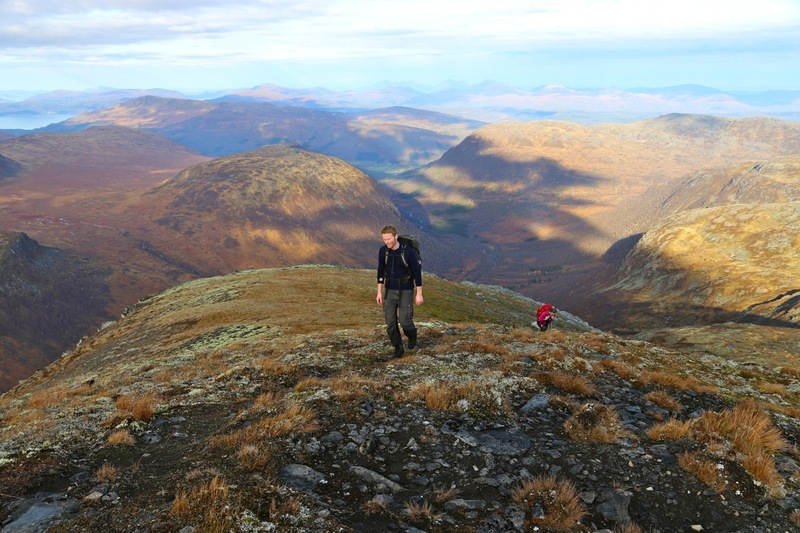 See also a separate entry for the Trollhøtta 1299 meter summit. 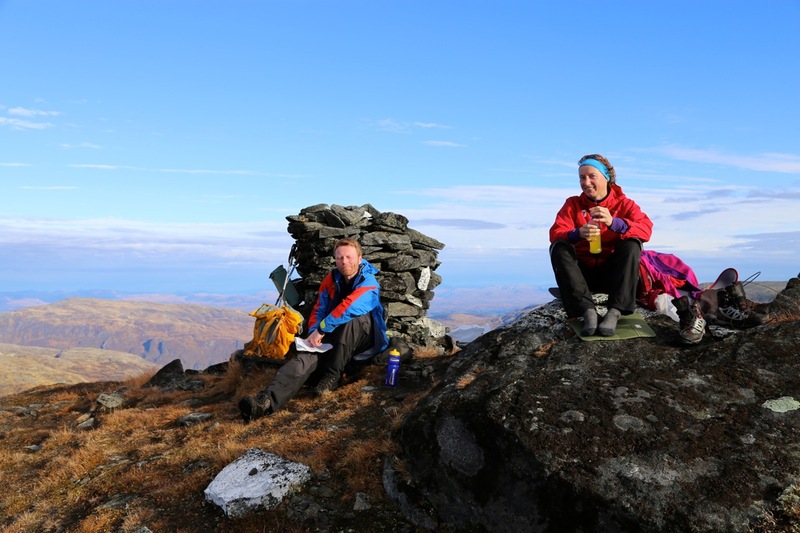 After the annual board meeting in Erling Bjørstad Stiftelse in Trondheim, we travelled to the very nice DNT self-serve hut Kårvatn at the innermost end of the road that serves Todalen. We decided that this should be our headquarter for the weekend. Kari Hallan (DNT Trondheim) and Lars Rasmus Sandvik, administrative head of the foundation, participated besides myself. We got up at 0600, breakfast and travel, departing from the trailhead at 0800 The weather was already nice and improving. We had a nice hike, arriving at 1130 at the first summit. After a nice break, we continued along the ridge and we all looked forward to the crux passage while ascending to the 1299 summit. No big surprises, but absolutely entertaining scrambling. We arrived at the second top, 1299 meter and prominence exceeding 100 meter, a bit before 1230. Another short rest, then onwards to our final and highest summit. 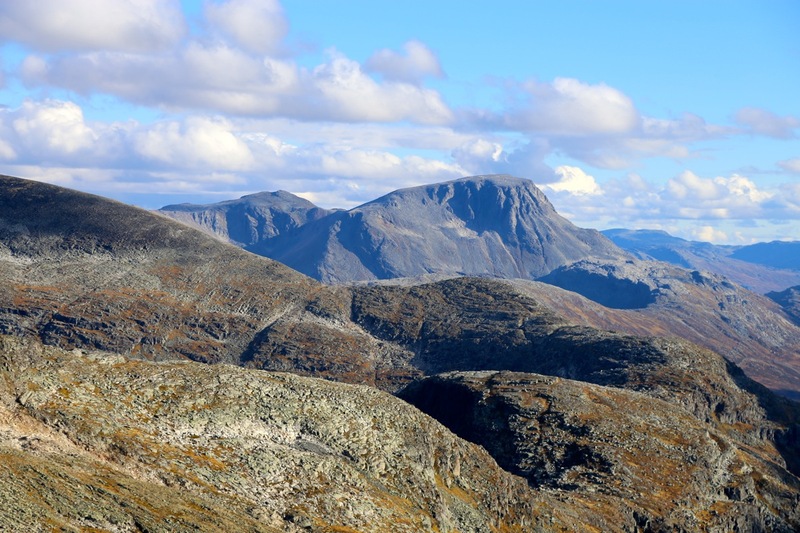 The view across to Dronninga and other well known mountains near Sunndal, was nice and clear. As the valley curved left, we also got a nice view straight down the valley. Arrival at the final and main summit around 1330, - 5.5 hours. We took a long rest in near perfect weather before descending. The descent went well until we somehow, very misguided, went down to the upper lake. Big mistake! We most likely lost about 45 minutes while traversing cumbersome boulders. Subsequently, the descent went fine and we soon recovered the red marked trail leading back to the trailhead. We were back at 1800, a very nice 10 hour trip. Thanks for good company to Kari and Lars and to Kari for suggesting and planning this trip. View back towards the first summit. The traverse, as seen from the main summit. Snota, as seen from the main summit. 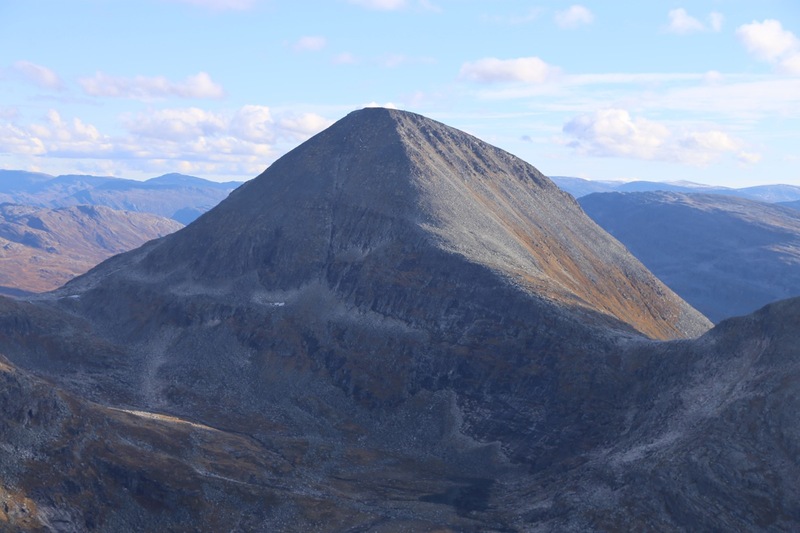 Neådalssnota, as seen from the main summit. 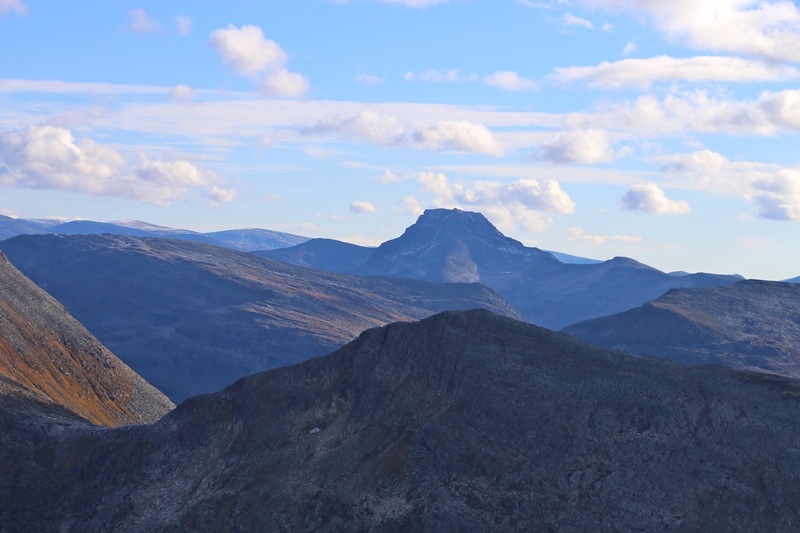 Rognnebba, as seen from the main summit.